Detail from a wrought silver plate in the Castelvecchio, Verona. Said to come from northern Italy and date to the sixth century CE. Photo by Sean Manning. 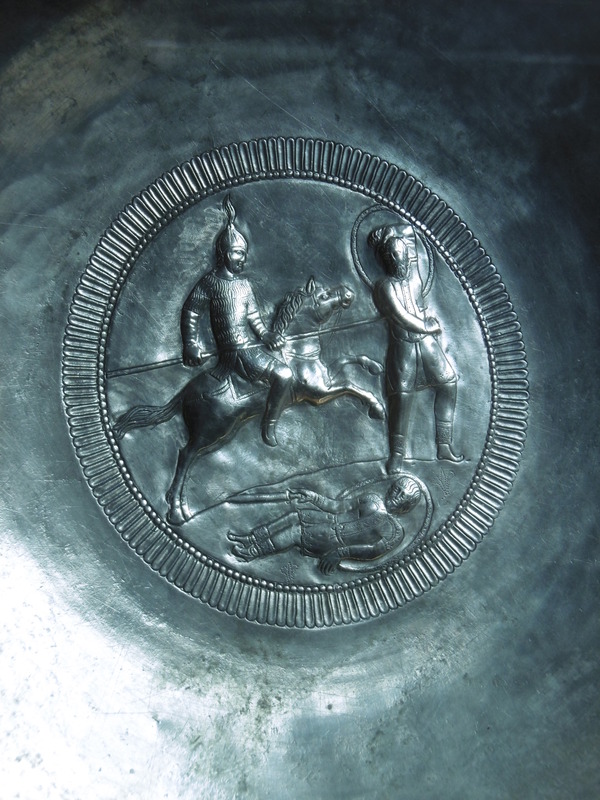 One of the treasures housed in the Castelvecchio of Verona is an extraordinary silver plate. It dates a bit later than the Sasanid silverwork which I have blogged about before, to the age which gave us Maurice’s Strategikon when East Romans, Goths, and Lombards were struggling for control in Italy and destroying what was left of the wealth and learning built up in the centuries when Rome ruled the world. The horseman wields his lance in both hands. 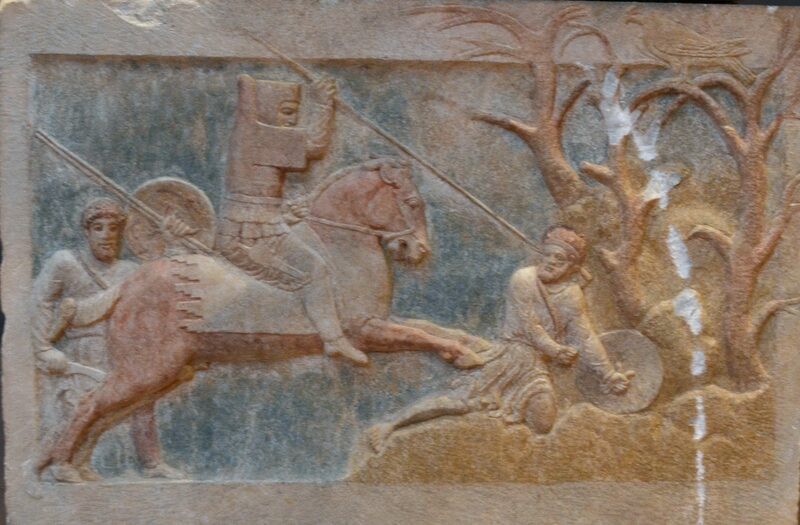 This was a popular technique for heavily armoured cavalry in the ancient world, although it is a bit unusual to see someone with just a helmet and a shirt of mail employ it. I am embarrassed that I can’t give any other sources, but any basic work on Roman cavalry should have them (Latin contus and Greek κόντος “bargepole > long, thick-shafted spear” are good keywords). The horsemen of Comitatus in the UK find that this works especially well in a ‘foyning’ style of combat, riding close to the enemy and feinting and thrusting from just out of reach rather than making a sudden swift rush through their line and hoping that your one thrust goes home. After the Black Death a two-handed grip shows up again in the Fechtbücher from north of the Alps by writers like Sigmund ain Ringeck who liked the extra leverage in parrying. The “helmet with small plumes or tassels on top” is mentioned in the Strategikon of Maurice (1.2, 12b4). Plumes like this were traditionally of dyed horsehair. Maurice was not interested in the colour … he used coloured flags and pennons to mark individual units of cavalry. 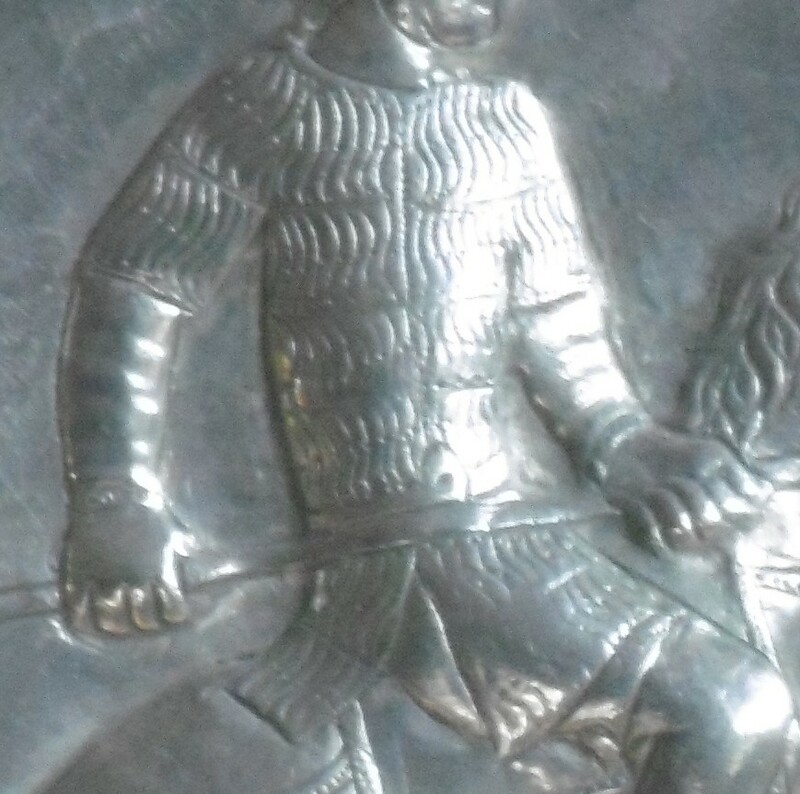 Closeup of the armour on Detail a wrought silver plate in the Castelvecchio, Verona. The horseman’s coat could be mail or lamellar. It has sleeves (which work better in mail) but the rows are broad and it seems to open up the front which is more typical of lamellar. Written sources are not so helpful here, because the Medieval Greek terms for types of armour are notoriously difficult to interpret. Secular documents were not preserved in the Greek Christian world in the way that they were in France or Tuscany, so historians are reduced to picking terms out of literature written in an deliberately archaic style for people who didn’t need to be told the everyday names for different kinds of armour. Cropped from a photo by Dan Diffendale https://www.flickr.com/photos/dandiffendale/10506953106 under a Creative Commons CC BY-NC-SA 2.0 license. Whether in the Achaemenid empire or the Gothic Kingdom of Italy, the doomed footman tries to draw his sword as Death in the form of a hero on horseback swoops in. In my life so far, I have been privileged to be able to visit Verona three times. And if that were all the profit that my time in Europe brought me, I could not complain. Edit 2017-08-05: Corrected a silly statement about the armour and posted a closeup photo.